Town of Redcliff planning specialist Jordan Zokowski talked to Josh Swanson of the Medicine Hat Skateboard Association about location for the town's new skatepark on Jan. 16. Redcliff skateboarders may not have to travel to Medicine Hat much longer to play at the city’s park as the town is in the early stages of developing their own outdoor skateboard facility. 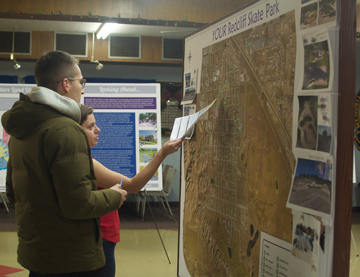 The town held an open house on Jan. 16 at the Redcliff Legion to invite youth and their families to come out and provide feedback on a design for the community’s future skateboard park. Jordan Zukowski is the planning specialist for the Town of Redcliff and said the open house was not only for the skateboard park but also an opportunity to get input on their Municipal Development Plan, which has been in the works for a year-and-a-half. “When we first started the project, we did a lot of consultation with the public and ask them what they wanted Redcliff to be in the future,” she said. After discussions with the public, town council allocated $215,000 in their 2019 budget for the project and applications will be submitted for grant funding. “We’re in the very beginning stages,” said Zukowski. “What we’re asking people today at this open house is where they would like to see a skateboard park in Redcliff and what kinds of elements or features in the skateboard park. The main feedback at the open house for a design was people wanted a park that is suited for all ability levels and they have visited parks that have too many steep slopes and advanced terrain elements. Potential location for the skateboard park included the empty spot by the pool, near the baseball diamonds and soccer fields and by the police station. There has not been a timeline set for beginning the construction on the project.